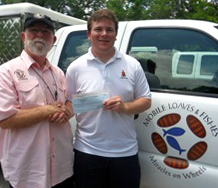 KΣ Treasurer Sean Hoyle presents Mobile Loaves & Fishes president, Alan Graham with a check. The Tau Chapter began a new era of charitable giving with a fundraising event held at Guero's Taco Bar on May 10. The Chapter raised $810, with all proceeds going to Mobile Loaves & Fishes , an Austin-based charity dedicated to providing food, clothing and dignity to those in need. The Chapter extends a special thanks to Tito Beveridge, Rob & Cathy Lippincott, and Dr. Denton Cooley for supporting this event. Chapter President Preston Munster reports that this is the first of more community outreach projects for the Chapter. "We plan to organize at least one philanthropic project each semester to help those who are struggling in our community," said Munster. "Next semester, new members will provide weekly tutoring sessions to elementary and middle school students needing help with their school work," he added. Summer rush gets more competitive each year at UT Austin. For the Tau Chapter to continue to grow and keep its place as one of UT's top ranking fraternities, we need to do everything possible to recruit a quality pledge class for the fall. This will take not only hard work, but financial support. As you can imagine, considerable cash flow is needed to run the basic operations of rush throughout the summer. We have relied in the past on contributions from the alumni, which is much appreciated. But we need to do our part as well. Our fundraising target is $80,000, an amount we believe will be sufficient to compete with any other fraternity at UT. We hope to build a pledge class of 40-plus in the fall. We ask that both actives and alumni help us reach this goal. 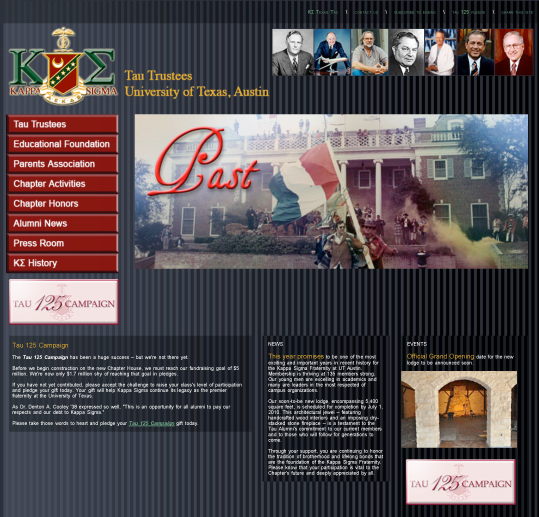 Kappa Sigma's new home page. To chronicle the many exciting things happening with the Tau Chapter, we have launched a new Tau Trustees website along with Tau eNews, your new monthly online newsletter. We hope you will find the new site and the news letter to be both informative and engaging. Among the features of the new site, you'll be able to pay your Alumni dues online through a secure link provided by PayPal. 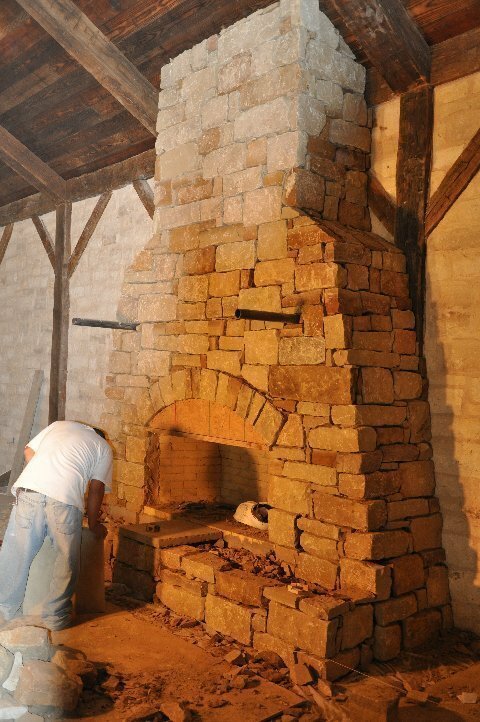 The new lodge is nearing completion and is stunning in every respect. Our fraternity is one of the finest on the UT campus. Our young men are excelling in their studies (exceeding a 3.2 GPA) and are working to make rush a great success. Please keep the momentum going by paying your KΣ Alumni Dues today. Your dues will help the organization provide the communication and fundraising tools we need to continue the Kappa Sigma legacy that has served us all so well throughout our lives. 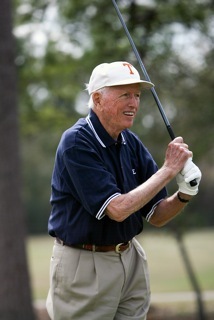 Dr. Cooley hits the ceremonial first shot. 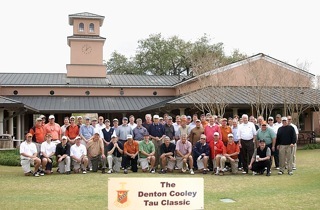 Park Golf Course was the setting for the 2010 Denton Cooley Tau Classic, marking its second year as a successful fundraising event for the Tau Chapter's annual rush activities. 2009 Tau Man of the Year George Alcorn and Event Organizer Jim Pritchett. "The tournament is a great way to raise money for the Tau Chapter while enjoying a day of fun with our old and some new friends," said event organizer Jim Pritchett (Tau '71). " 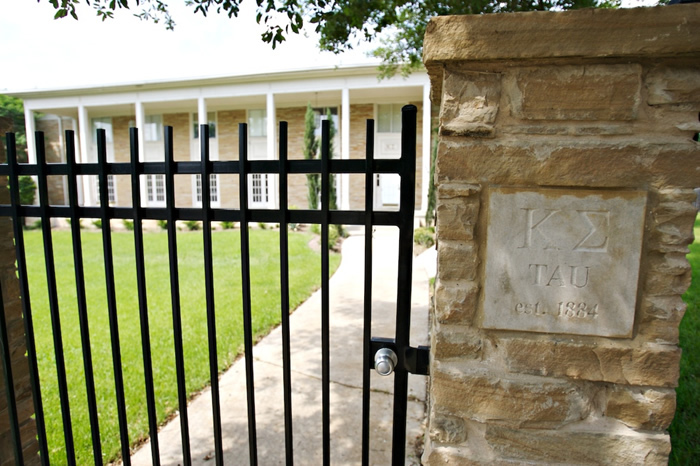 We've had representatives from some eight decades of alums and even some Kappa Sig brothers from LSU, Mississippi and SMU." Pritchett added. The second annual Denton Cooley Tau Classic was held March 16, 2010. 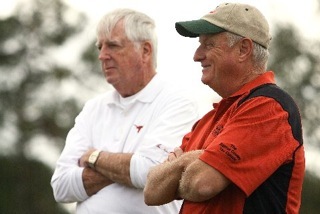 In the two years of the tournament, Tau Chapter has included more than 90 alumni from Houston, Dallas, Austin, Fort Worth, Corpus Christi, Kerrville, Brenham, San Antonio and Gruene. Daddy-O watches the flying iguana. A Kappa Sig who can always be counted on to bring levity to these serious times is Austin-based artist Bob "Daddy-O" Wade. 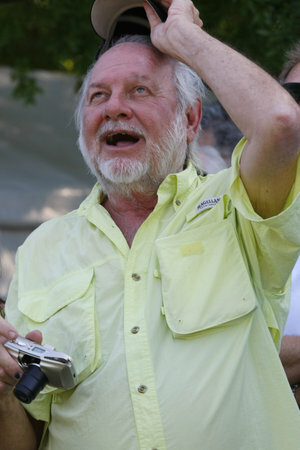 Surrounded by a cheering crowd, Wade, and his wife, Lisa, celebrated the much anticipated June 1 landing of the 40-foot iguana sculpture he created 32 years ago as it was lowered by helicopter to its new home atop the roof of the Fort Worth Zoo's animal hospital. 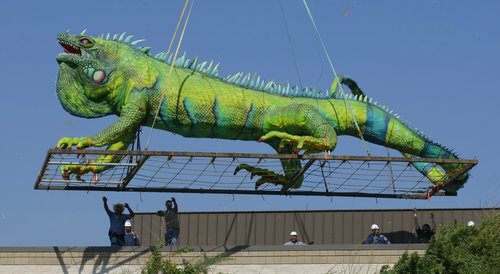 The iguana -- on loan to the zoo from Fort Worth Civic leader Lee Bass -- enjoys a celebrated history as "Iggy," the crowning glory of the Lone Star Cafe in New York City, where he reigned as a rooftop landmark for 11 years. After more than a decade in retirement, the iguana has ascended to his rightful place in Texas pop culture. 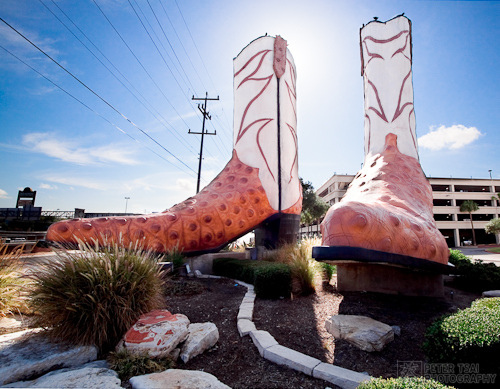 Other famous works of art created by Wade include the Dancing Frogs at Carl's Corner, Texas, the World's Largest Cowboy Boots at North Star Mall in San Antonio and Smokesax, a saxaphone constructed from a Volkswagen body, oil field pipe and a surfboard for the mouthpiece, located at Billy Blues in Houston. 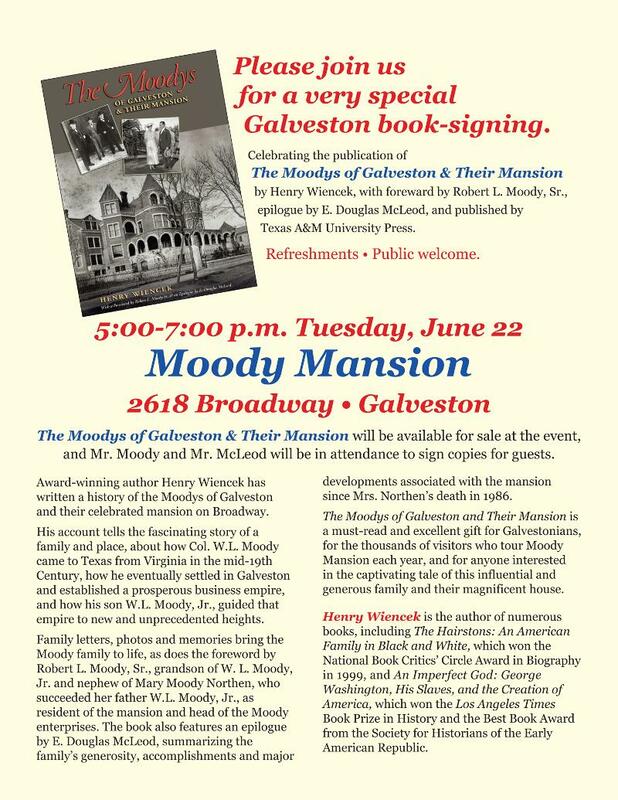 Doug McLeod, Director of Development for The Moody Foundation and Galveston civic leader, was an honored guest at the June 22 book-signing launch of "The Moodys of Galveston & Their Mansion," written by award-winning author Henry Wiencek. McLeod wrote the epilogue, summarizing the family's generosity, accomplishments and major developments associated with the mansion since Mrs. Northen's death in 1986. 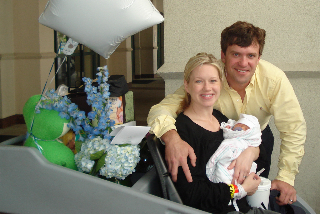 Libby and George Alcorn have a new grandson, Luke Ryan Alcorn, born March 31, 2010. Here's Luke with his proud parents, Kim and Ryan Alcorn (Tau '96). Luke's uncles are George Alcorn, Jr. (Tau '79), Wright Alcorn (Tau '81), and Avery Alcorn (Tau '06). 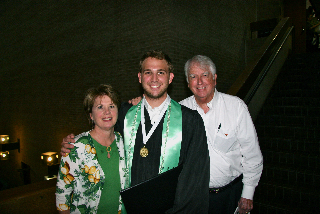 Avery Alcorn (Tau '06) with parents Libby and George after receiving his Bachelor of Science Degree from the Jackson School of Geosciences at the University of Texas at Austin, May, 2010.